This dual purpose workshop is suitable for either leisure or work activities, thanks to its generous dimensions augmented by an apex roof. There’s even the option of adding shelving around the walls to make it even more convenient as a workshop or place to indulge your favourite hobby. When walking around we found it spacious and comfortable, helped by the built in skylight and integral ventilation. 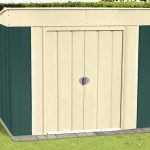 It’s important that metal workshops have adequate weather proofing, especially ones that come in this price band, so we were pleased to see the emphasis that Shed Baron had placed on this factor. From the apex roof that simply carries rainwater away, to the strong and rust resistant galvanised exterior, this workshop lets you forget about your weather worries. For confirmation of this, you only have to consider the twenty year warranty provided by the manufacturer, a sign of their confidence in the high quality of materials used. Despite its large size it still looks appealing, thanks to the cream and light green colour scheme that comes as standard and its traditional styling. 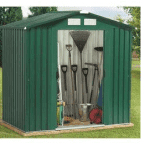 Whether used in the garden, or at a workplace, this is a workshop that will prove as invaluable as it is durable. When we review metal workshops, we take particular note of how resistant they will be to weathering over the years, as once attractive structures can soon look old and fatigued if rust takes hold. That’s why we were pleased to see that an apex roof has been included here, as it stops rain and snow from sitting on the roof. Combined with the galvanised nature of the steel, it means that this workshop should look as good as new many years after it is first installed. This is a workshop of substantial size, and yet it’s always helpful to have a little more space available, which is another advantage provided by the apex roof. The maximum height of the roof is 2.25m, and it has an eaves height of 2.00m. 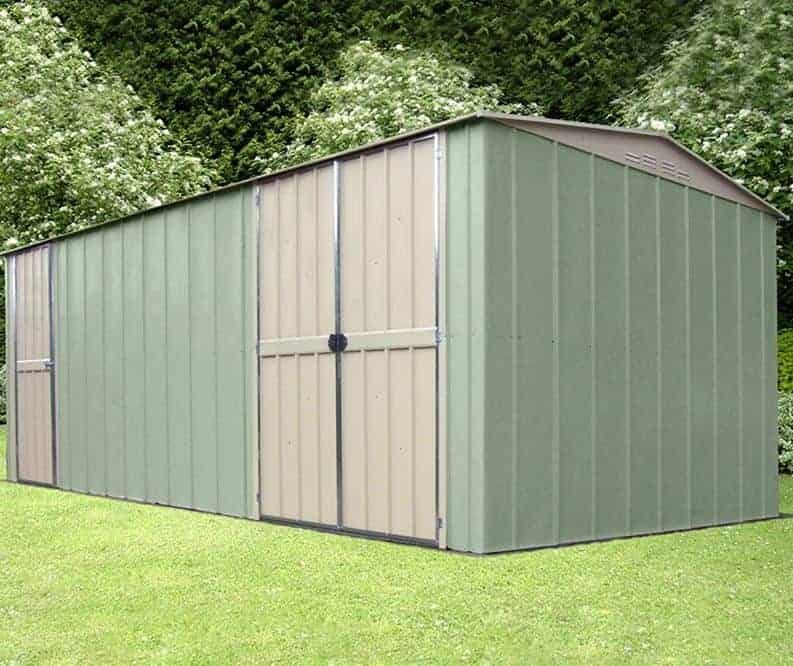 The dimensions of the shed itself are also important to note, being a depth of 5.78m and a width of 2.95m, as these make up the size of the base that will have to be constructed before the shed is put in place. The frame of a metal workshop is all important, as stability is vital when exposed to windy conditions. It was pleasing to see that the frame used in this workshop is double braced, as this gives extra strength to the joints and increased rigidity throughout the structure. The metal used is 0.3mm thick galvanised steel which has been hot dipped. This gives the steel extra strength and toughness, and also prevents water getting in and causing rust to occur. The workshop comes without an integral floor, but that’s because it’s designed to be fitted to a pre-constructed base. Concrete is recommended for this purpose, and full instructions are given on how to make a base of the right size and strength for the workshop to be placed upon. We were really impressed by the 20 year warranty supplied by the manufacturers of this workshop. 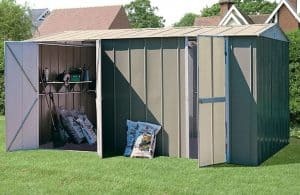 This means that once the workshop has been erected, the owner will have complete peace of mind whatever the weather without having to worry about unsightly rust that could potentially compromise the structural integrity. We were also impressed by the paintwork. 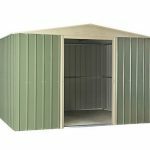 With three coats applied it adds extra weather protection, and we found the green and cream colour scheme pleasing on the eye as well. There are two doors on this workshop, and we were impressed with the strength of both of them. That’s because they are made of tougher steel than the already strong steel used in the rest of the building. A single door allows easy access for personnel while the double door, situated at the opposite end, and which has an opening of 1.30m and a height of 1.97m, can be used to bring heavy machinery or even objects such as motorbikes into the workshop. There is a skylight included within the apex roof, and we were impressed by the amount of light that it let into the building, although supplementary lighting will be required if you intend using this as a workplace. Even though light is allowed in through the skylight the lack of windows means that there is excellent privacy, and this also has security implications. Because passers by won’t be able to see what’s inside the workshop, your valuables will be hidden away. We still feel that a pair of padlocks could have been included as standard, so these will need to be purchased along with the workshop. Once strong padlocks have been used, and the pad bolt locks make them easy to attach, then the workshops can also act as excellent and capacious secure storage units. The only optional extra offered by the manufacturer at point of sale is a set of high quality Hilti screws. 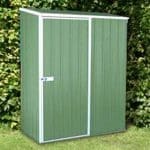 These are very tough and durable, and can be used to securely fix the workshop to its base, but again these could have been included along with the fixtures and fittings of the workshop itself. There are many other extras available from other sources for a metal workshop such as this. Padlocks and a security alarm would be the first that we would recommend, but internal lighting and additional shelving can also prove a wise purchase, and help to give the workshop a professional touch. 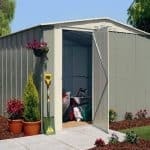 Shed Baron are aiming for the top end of the market here, and this shows in the high quality components and finishing. From the triple painted exterior to the chamfered corners, precision has been applied. High tensile galvanised steel can be very durable and water resistant, so were pleased to see that the manufacturers have acknowledged this by providing a 20 year warranty. 10 foot by 19 foot is more than enough for most workshop purposes, and could easily be used for a small commercial operation. The tall roof, helped by the apex, gives a lot of room to walk around in. 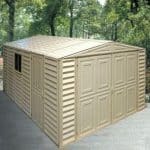 Despite its large size when constructed, this workshop will fit through a typical house door when delivered. We recommend taking time to thoroughly read through the instructions and laying out the components in the order they’ll be used, before beginning the installation itself. After this, you and a friend or colleague will be able to complete the installation within two days. When considering the price tag, you also have to consider the longevity of the building. With its guarantee of at least 20 years, this becomes much more affordable. Final Thoughts: Whether you’re looking for a workshop for a metal working or wood turning, or even a shed where you can safely tinker with a motorbike or machinery, then this generously proportioned workshop is hard to beat as long as the price is affordable to you. We would have preferred further security to be included as standard, in the form of padlocks, but these are inexpensive purchases compared to the workshop as a whole, and the quality and longevity of the materials used in this garden building certainly impressed us. With a 20 year guarantee as well, it really is a workshop that you can install and then not have to worry about.